Abstract: We present an algorithm for creating high resolution anatomically plausible images that are consistent with acquired clinical brain MRI scans with large inter-slice spacing. Although large databases of clinical images contain a wealth of information, medical acquisition constraints result in sparse scans that miss much of the anatomy. These characteristics often render computational analysis impractical as standard processing algorithms tend to fail when applied to such images. Our goal is to enable application of existing algorithms that were originally developed for high resolution research scans to severely undersampled images. We illustrate the applications of the method in the context of neurodegeneration and white matter disease studies in stroke patients. Bio: Polina Golland is a Henry Ellis Warren (1894) professor of Electrical Engineering and Computer Science at MIT and a principal investigator in the MIT Computer Science and Artificial Intelligence Laboratory (CSAIL). Her primary research interest is in developing novel techniques for medical image analysis and understanding. 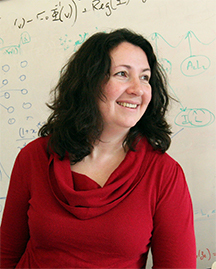 With her students, Polina has demonstrated novel approaches to image segmentation, shape analysis, functional image analysis and population studies. She has served as an associate editor of the IEEE Transactions on Medical Imaging and of the IEEE Transactions on Pattern Analysis. Polina is currently on the editorial board of the Journal of Medical Image Analysis. She is a Fellow of the International Society for Medical Image Computing and Computer Assisted Interventions.